Children are welcome: High Chair available. 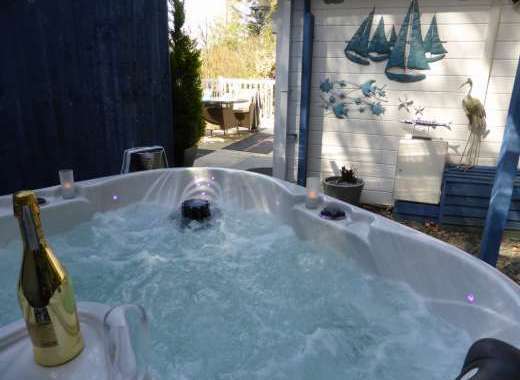 Book a hideaway cottage in Brynberian in the Pembrokeshire Coast National Park. Not secluded but in a peaceful residential location in the village is a stone-built traditional cottage surrounded by beautiful gardens with flower beds and shrubs. 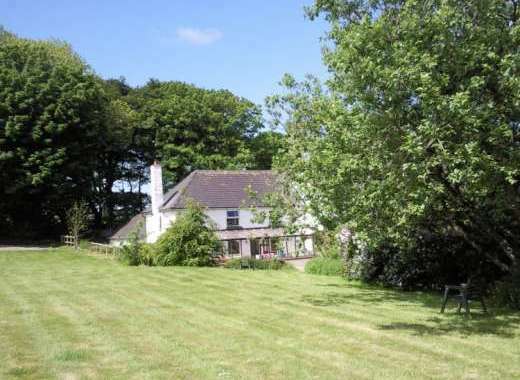 This Brynberian holiday cottage sleeps seven people in 3 bedrooms. The views of hills and valley all around are magnificent – it is worth coming for those alone. The interior of the cottage is smart and contemporary and although main shades are pastel and subtle, there are bold splashes of colour in the soft furnishings. There is a nicely proportioned sitting room with a log burner. A useful snug in stunning turquoise stores a sofa bed and a desk where guests could set up their laptops(there is WiFi) and charge up ipods in the ipod dock. A black fitted kitchen contrasts smartly with pale coloured walls. The hexagonal dining table has chairs in a striking red pattern. This cottage in Brynberian has all the ingredients for a very good holiday in the national park. Three bedrooms offer super king-size bed, a double and twin. There is a bathroom with a bath and a separate shower room. Gardening is the obvious passion of the owner because the garden is simply divine during the summer. A wrought iron table and chairs is a lovely place to sit and rest amidst the flowers. A barbecue is often a welcome bonus during a holiday. Guests are allowed to bring up to two small dogs with them. There is private parking on the driveway for two cars. Brynberian is a fairly quiet place which pleases many holidaymakers. If you yearn for a little more activity, head for the coast to Newport or Cardigan where there are all kinds of watersports, eateries, shops and entertainment.